BUT, we assure you, there are none that will do a better job of providing your group with a world class golf experience and a can-do attitude of service to back it up. Originally established in 2002, The Golf Club at the Resort’s beautiful terrain of rolling green fairways, oak studied woods and lake view vistas is a peaceful sight to the eye. We made a great thing even better completing a major re-design in 2006 adding new bunkers, greens and irrigation under the watchful eye of the General Manager. The Golf Club at the Resort was created with players of all levels in mind: our course consists of 4 sets of tees so everyone can have fun! Perhaps the most common compliment we hear again and again at The Golf Club at the Resort is the excellent condition in which we maintain our course. We strive to maintain tournament level conditioning everyday, all year long! Conveniently situated for easy access from all over DFW. Our clubhouse Dining room and pool side terrace accommodates groups of many sizes. These facilities seat from 80 to 150 and are available before or after your event. Locker and shower facilities for both men and women are available. 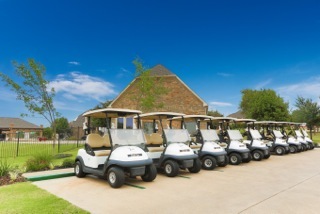 We are proud of our clubhouse facilities and feel certain that you will find that they will exceed your expectations. Our shop has a great selection of men’s and women’s apparel, equipment, accessories and of course, tournament gifts. Special pricing is available for group volume purchasing. Our staff members are experienced in the art of hospitality and are here to help you with every aspect of your event. We are committed to providing you with friendly assistance from the planning to the production of your event and will be glad to customize a tournament or outing to your exact needs. That said, we think you’ll find our tournament package included with all events is a pretty good start! Pre-tournament announcements, event scoring and awards presentation. Use of pavillion for scoring and awards. A free round of golf for four players, as our thank you to you for having your tournament with us! Call or e-mail us today and let us custom design a memorable experience for you and your guests.